You know how much I love Life is Strange. 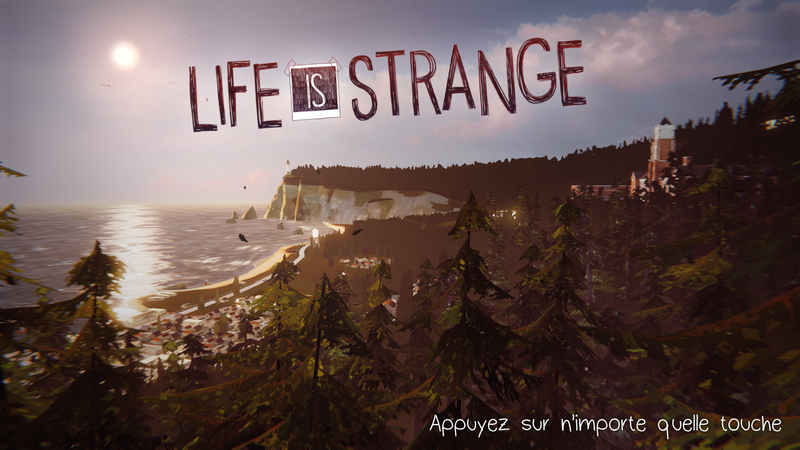 Although its plot revolves a lot around the relationship between its two central characters, Max (the protagonist) and Chloe (her best friend), Life is Strange is a game that tells you stories – stories, plural. The story of Arcadia Bay, the town where the story takes place, as well as the stories of its inhabitants. This actually proves crucial at some pivotal moments of the story, when the player is confronted to choices related to these secondary characters and/or to the town itself. 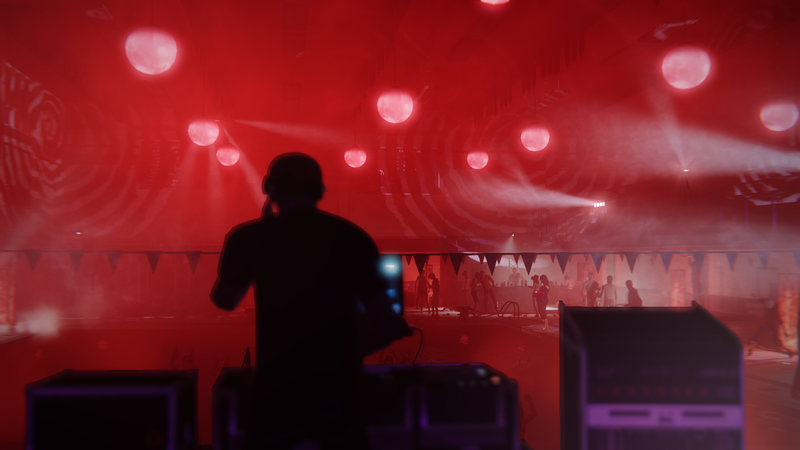 In order to tell these different stories, the developers from Dontnod Entertainment opted for a particular narrative technique which they refer to as “Environmental Storytelling” – as in “a story that is told through the environment”. 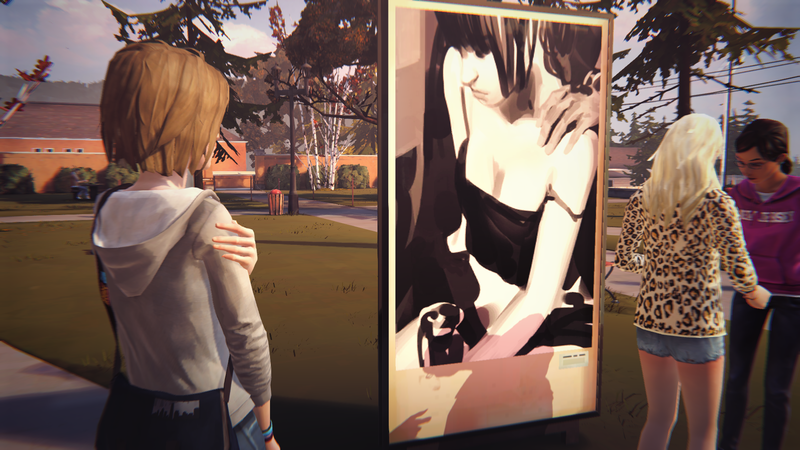 Although Dontnod did not invent the concept, they certainly made a brilliant use of it in Life is Strange, which is why I believe this game is a great illustration of this particular narrative technique. How does it work and how does it make the plot of the game better? This article contains minor spoilers. It is safe for you to read even if you have not played Life is Strange; I highly recommend that you play the game, however, for a better understanding of this analysis but also because Life is Strange is AWESOME. Seriously. Play it. Besides, the first episode is now FREE for everyone. In real life, every house, every building, every place has a story of its own. People have lived here, laughed here, cried here, died here. In video games – but also in movies, for instance – the settings that are explored and shown are always meant to tell a story of their own, too. The accessories and decorations are often more than just that – they can be family photos, everyday objects, etc., that are more or less significant for the characters and for the story. The settings are meant to be a reflection of the characters that inhabit them. The main difference between movies and video games is the fact that you can actually explore the environments in a game, while movies only let the watcher see small portions of the settings. This makes environments even more important in games: everything has to make sense, story-wise, as the player can literally examine everything in detail. Depending on the games, settings can have more or less importance in terms of narration. In games like Tomb Raider, which are all about exploring ruins of the past, the places you explore are a reflection of the life as it used to be centuries ago – the settings do tell a story, the story of something that has been. You might find what used to be a village, or everyday objects that are part of a particular civilization. In many games, level-designers use the settings to recreate history. That already qualifies as environmental storytelling, in a way – but this is not something that is specific to video games. As she explores the ruins of ancient civilizations, Lara Croft finds everyday objects. Today, however more and more games tend to use environmental storytelling in a way only video games can. Most of today’s video games add collectible-finding as a subquest for the player: “find all secret documents”, “collect all of Y’s letters”, “read all of X’s journals”. While these quests are often just another trophy-awarding game mechanic, they do add another layer of narration to the story, with these secret items consisting of texts related to the story, somehow (newspaper articles, diaries, etc., detailing some elements of the plot). This is something that movies cannot do – the linearity of a movie script doesn’t allow to freeze the narration with extracts of articles or journals. In Life is Strange, environmental storytelling is not a subquest – it is the actual core of the game. Most of the game time is spent examining the settings, and about 50% of the story is told through the environment, with crucial elements of the plot scattered around the places you explore, in the form of photos, posters, letters, journals, computers, and other objects you can interact with. Most games encourage you to constantly move forward, towards the next action, the next mission. Contrarily, and because Max has, literally, all the time she needs, Life is Strange invites players to take their time to explore the game and find all the plot elements hidden here and there. The city in which Life is Strange takes place is shrouded in a mysterious, eerie and supernatural aura that gives it some sort of soul. The main menu shows the town, with its emblematic places (the lighthouse, Blackwell Academy, the beach…). Throughout her journey, Max finds several photos of the town, she comments on how she was always fascinated by the forest that surround the town, and how it almost looks mystical. There is a totem of unknown origin in the courtyard surrounding Max’s dormitory at Blackwell Academy. At several moments of the game – including a crucial one – the “ghost” of a doe appears. In many ways, the town appears to have a conscience of its own, a life of its own. The developers really tried their best to make the fictional town of Arcadia Bay appear like another character of the story. Max’s threatening premonition of a storm destroying the town is a crucial element of the plot – it soon becomes clear that her powers are affecting the town itself. It is very interesting how Life is Strange managed to connect all the elements of the game together – the setting is not just a setting, it is also an essential element of the story. 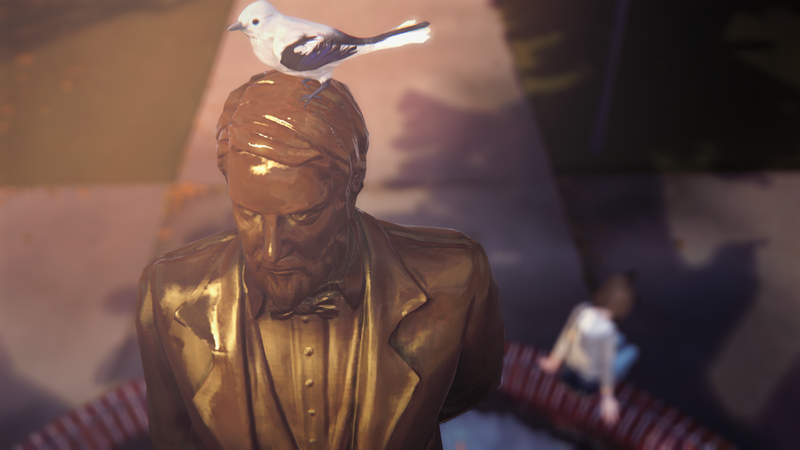 In many ways, Life is Strange references the Art of Photography. Max is a student in Photography, takes pictures of almost everything around her and repeatedly takes selfies of herself. What is very interesting about the environments in Life is Strange is the fact that, somehow, they were thought and created a lot like photographies. Every environment in the game has its own color palette, its own ambience. The areas that Max explores are generally limited, closed, framed: you cannot get out of the boundaries, as though every single environment in the game were a coherent unit, one fragment of a bigger picture. In Camera Lucida, the French semiotician Roland Barthes uses the phrase “it-has-been” (ça-a-été) to describe the uneasing feeling you get when watching some photos: the realisation that the places and people that are on the picture have lived, have existed – even though they might not be alive anymore. 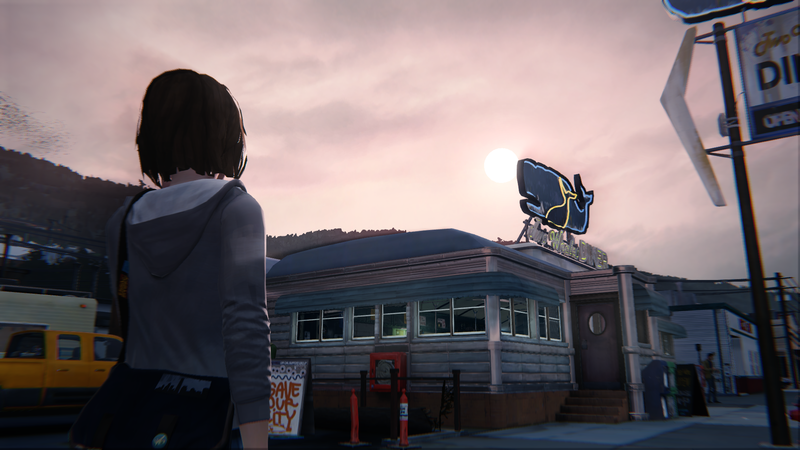 I believe that the feeling that “it-has-been” is particularly what makes the settings in Life is Strange so similar to photographs. These environments have been, they have a story to tell. The places you explore are not just there to serve as the setting of Max Caulfield’s story, they also reflect the story of what has been there before. It’s especially obvious with the many, many references to the missing Rachel Amber that are scattered throughout the environments. Although Max has never met her, and even though her current whereabouts are unknown, you get to know Rachel by exploring the game’s environments, through photographs and graffitis that were placed there before. 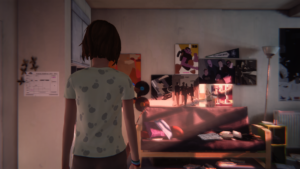 Several times in Life is Strange, Max explores intimate places – places that reflect the characters that inhabit them – such as her fellow students’ bedrooms, Chloe’s stepfather’s garage, Blackwell Academy’s Principle’s office, etc. This is where environmental storytelling gets interesting: the game levels actually mirror the personalities of the characters of the story. There are no real quests to complete in a game designed like Life is Strange. It’s all about taking the time to explore everything, read everything, examine everything – that’s how you’ll understand things about the characters that you might not have noticed otherwise. If you pay enough attention, you might even realise that the game’s biggest plot twists are given away at the very beginning of the game, through elements of the environment. The characters’ darkest secrets are not exposed in cutscenes, but in the environments you explore and the items you examine – you will find pregnancy tests and bottles of alcohol, family photos and desperate letters. Because Max is able to rewind time, you even get to sneak around people’s personal stuff in front of them, then go back in time so that they never know you found out about their secrets. Environmental storytelling adds more depth to the characters. Secondary characters that do not have that much screen time in the story become far more important, complex, and interesting, only because you have found out more about them through the exploration of the game. Narratively, this particular use of environmental storytelling allows richer and deeper storylines and characters. It is also a great way to involve the player in the narration. It gives the player a certain responsibility: if he does not pay enough attention to the story elements hidden in the game, he might miss the point of the story itself. At the end of Episode 2, there is a crucial moment of dialogue with another character that requires the player to actually know this character’s story – otherwise the consequences might be dramatic. Video games are all about challenges and goals – games generally reward the player for achieving these goals. The brilliancy of environmental storytelling is that the real reward for exploring the environments is the story itself, not a mere trophy or achievement. 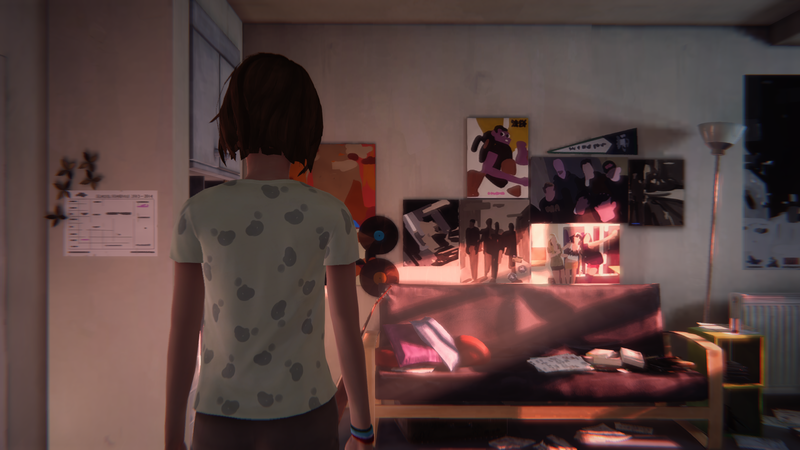 Although many other games have used environmental storytelling before (let’s mention The Last of Us, for instance, or Silent Hill), it is used brilliantly in Life is Strange, because it is what makes the story and the characters loveable as well as ambivalent, and the game paves the way for other games relying almost exclusively on this narrative device. As a matter of fact, Square Enix and Dontnod Entertainment have just announced that they will be partering with Legendary Digital Studios to develop a live action series based on Life is Strange. I’m not a big fan of movie/TV adpatations of games. Especially because they often lack what made the original game’s narration so interesting. Environmental storytelling is just one of the many devices that can be used exclusively in video games – or at least only in an interactive medium. Yet, it seems like video games still aren’t recognized as a legitimate medium for telling stories, since almost everytime a game sells well, a movie/TV adaptation comes along… But hey, at least Life is Strange is a great game that has tried something a bit different in terms of narration, so let’s focus on that and hope for more games that prove once more how immersive and different game narratives can be.